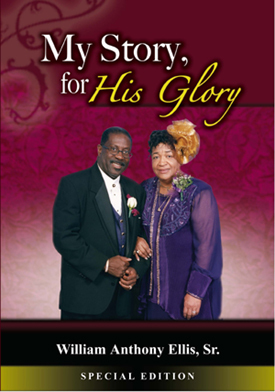 My Story, for His Glory, is a riveting biographical account of the life and ministry of Apostle William Ellis, Sr., one of Chicago’s most controversial and charismatic religious leaders of our time. Spanning over a lifetime of dedicated service to the Lord, Apostle Ellis shares his powerful story that is filled with glorious highs and deep traumatic lows. From the ministry to marriage, from the pulpit to politics, and from the court house to the big house, Apostle William Ellis tells it all in amazing uncompromising candor. Unafraid to confront adversity and no stranger to controversy, this amazing autobiography promises to evoke interest and spark passionate debate. Some claim to know the whole story, while others can only speculate. However, no one tells it better than the Apostle himself – because, it’s truly his story for God’s glory. Apostle William A. Ellis, Sr.